Don't see exactly what you are looking for and would prefer something Custom? No problem! 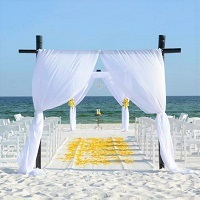 Let your Coordinator know what you are looking for and we would be happy to quote you any custom ceremony set ups like adding an Entry Way Arbor, Custom Signs, and More!